Which theory do you believe is most responsible for Porre's power? Vote after reading the article. This aspect of the Chrono series never really confused me for one reason - Norris has a gun. If Porre overthrew Gaurdia so quickly and so decisively, we can assume that they had an overwhelming advantage, and the most obvious advantage is that they had guns. Gaurdia would have been no match for this new technology. Okay, you're all saying, 'Well, Lucca had a gun, and she lived in Gaurdia.' Yes, but these guns were developed by Lucca for personal use and were never mass produced. It's my theory that some time in the past, Porre spies (because Porre had obviously been planning to overthrow Gaurdia for a long time) infiltrated Gaurdia and stole plans from either Lucca or Taban and began to mass produce guns. With the advantage they gained from having an army trained with Lucca's design of guns, there's no way the war could've lasted more than 4 or 5 years, which coincides with Porre overthrowing Gaurdia in 1005 AD. So yeah, what I guess I'm trying to say is... I'm a total nerd who has played these two games WAY TOO MUCH. Hmm need some evidence for the Dalton theory, huh? Then he teleports away, maybe to start his plan, and is not seen anymore in the game. I think a major theory actually rests in Chrono Cross. Remember, in the post-Chrono Trigger timeline, Balthasar arrives in a non-destroyed 2300AD and establishes Project Kid in order to save Schala. In a very convoluted manner, Project Kid sets off a chain of events that creates El Nido, introduces the Terra Tower/Dragonians/Elements from the Reptite Dimension. I would suspect that Dalton having magic - a non-existent ability for the people in pre-1000AD humans, allowed him to easily usurp the mantle of leadership from the Porre Mayor. Utilizing his knowledge of magic and what not, he easily could have tapped into the resources of El Nido (that wouldn't have existed in the previous timeline, ie Elements, Dragonian technology, etc) and built Porre into the military powerhouse we see in Chrono Cross. Plus, he totally corrupts the Masamune, which was housed in Guardia Castle. By corrupting and claiming the Masamune, I'm sure he was able to do some real damage on the battlefield. The question remains - how did he corrupt it? We know that the Masamune reflects the heart and will of it's wielder, but surely it wouldn't just turn like that. We know that somehow he made Masa and Mune fall asleep, and the blade was able to fully transform - and remain - evil. That's been my understanding, although some of it is based on assumption. I don't think El Nido had that much of a role. In fact, Porre doesn't seem to be that invested in the place until the events of Cross itself, long after the fall. More so with Radical Dreamers, where El Nido doesn't exist but Guardia still fell. It's not like there wouldn't be resources to obtain elsewhere that couldn't be as effective. Perhaps there are other Zealian artifacts the party never found, the elemental weapons from that dungeon that got removed from gameplay but still exists in the lore, Fiona's Forest, etc. As for the Masamune... yeah, that sounds like a good quetion. The only thing I can think of is that perhaps, once realizing Melchior was living in the era, he decided to... pay a visit to him and ask. Or "ask". We know from conversations with Luccia and Grobyc that Porre is reverse-engineering technology from a lost civilization. My pet theory is that Dalton knew where to find Zealian relics, and additionally used that knowledge to act as a Prophet-esque figure in order to influence Porre's leadership into attacking Guardia. Guardia's army didn't stand a chance against such superior weaponry. As for why Crono, Marle, and Lucca weren't able to stop the invasion, I'm thinking maybe they were reluctant to use their powers against other human beings. The only human enemies you fight in the game are Magus, Dalton, Queen Zeal, Bashers, Lashers, Thrashers, and possibly Mages (depending on what's under those hoods). In all those cases, the fighting was unavoidable. Maybe during the fall of Guardia, the group decided that capitulating would prevent unnecessary bloodshed. I could see them doing that, but then considering Guardia was attacked anyway, it would make me wonder why not act anyway then. Personally, I would first think Crono and Marle decided to fight and were simply overwhelmed with numbers. Powerful they may have become due to their time traveling adventures, they'd still have their limits. Or, Dalton applied the reverse of what happened to him back in Antiquity. He opened up a portal and sucked them in. As for Lucca, well, I would think she probably didn't had the chance. We don't really know if Truce was also attacked or if it was just the castle, if Porre first issued a formal declaration of war or simply went in guns ablazing. Maybe Lucca had to defend her home and/or Truce and thus unable to go to the castle to help, or she was at her home or Truce when the castle got attacked and figured it was out of her league, or had to stay to defend the area just in case. Certainly, so little info exists on the matter. It's a shame. Guys, we already know what happened. Crono and Marle were away during the Battle of Guardia and went off into the Dreamtime to explore all the worlds impacted by the fires of creation (or whatever it was; it's been a long time since I played Crimson Echoes). Just kidding. We know that's fan theory and not canon. 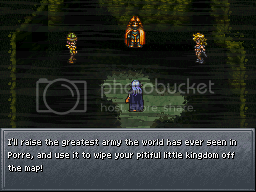 The only caveat that we have for the group's survival is that in the anime opening of Chrono Trigger, Crono has a picture of the entire CT crew. He picks it up (we only see his arms, but the armbands match, so I at least assume it's Crono) and looks at the picture, which seems to be reminiscing. Then, in Chrono Cross, we see the burning orphanage (when did that take place? 1010AD? ), and Kid and the other orphan kids had drawn all of the heroes (minus Magus), these pictures taped to the walls. Based on this, I do feel like kid and these orphans had some contact with Crono and Marle, even possibly the other party members. I'd like to think that the boundaries of space-time didn't stop them, even if the "most canon" ending indicates that everyone must return to their time once and for all (via the telepod gate). Maybe it's the optimist in me. overlooking the sea. He meets a new generation of heroes and he'd resolve to train them and help them out, and maybe even join their party. Perhaps even help them alter time so that another version of him can have a better life. Star Trek did that many times and I could see it working here. A Crono that lost everything he loves in the Fall of Guardia and longs for another chance. EDIT: Which, I just realized, is much happier version of Luke Skywalker in TFJ. Nah man, Crono totally became Miguel, that's the true theory! More seriously, the orphanage burned down in 1015AD. Personally, I think Lucca probably just told the kids stories of the CT adventure, and the kids used the photograph for visual input for their drawings. In all honesty, this is probably the true answer. Given the tone of Chrono Cross - which was not afraid to be darker, more realistic, and wasn't afraid to pull punches regarding our reverence to Chrono Trigger. However, the eternal optimist, the one that last remembers Crono and Marle floating off into the sky with a bundle of balloons, holding each other tightly... That version of me believes that they received their happily ever after. They got married; Robo and Glenn and Ayla came, and even Janus showed up (but refused to sit anywhere but the last row). Despite the Guardian-Porre War of 1005AD, Guardia remained intact, and Crono became King, and his reign was a good one. He and Marle had a family, and their son inherited Crono's spiky red hair and penchant for rushing off to save others. Peace never lasts, of course, but the reign of King Crono Guardia XXXIV continued to maintain an era of peace; it would be several centuries before tensions would arise again between the major political powers of Medina, Porre, Choras, and Guardia. Time would flow, but it would remember that Crono, Marle, and Lucca lives long, productive lives, and they truly left the world better than they entered into it. History remembered them all, and it remembered them fondly. My headcanon is that, in addition to providing military and technological leadership and advancement to Porre, Dalton also taught certain people Magic. Evidence for this comes from Radical Dreamers, where it's shown that ordinary people (e.g. Serge) can be taught Magic, and even Vera, who knows healing Magic, is known as the "Magic Chancellor" of Porre. Thus, being able to fight Magic with Magic would be a great boon for Porre. Add in Dalton, who, for all his pompousness, was still a military commander, and the regular use of guns and other techonology, and possibly five years of preparations ... I think Guardia was simply overwhelmed, as Acacia Sgt said. That's not to say Crono and Marle are definitively dead. There's no mention of Dalton surviving either. And Guardia is still intact, in some form, by 1020; the monarchy could simply be a figurehead now under the rule of a new Porrean government.